This entry was posted in Retirement Party and tagged Individual Retirement Account, IRA, Retirement, retirement planning, Roth IRA, Traditional IRA by Cole. Bookmark the permalink. 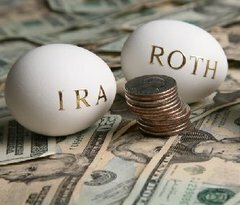 So where do I actually open up a Roth IRA account? Do you have any advice on choosing the right bank or broker? I’m actually in the process of doing this myself. First I plan on checking out each institution I bank or trade with to see what their options are. The two main things I am concerned with are the fees and investment options. The goal for me is to keep fees low and invest in a life cycle fund, which is a fund which will automatically reallocate between asset classes as your get older. It’s kind of like a set and forget it approach and is the same method I use for my 401k. So I would start with who you currently bank with and if you don’t like what is offered check out some of the major online brokers, Schwab, Etrade, TD Ameritrade, etc. looking for avg/low fees and ability to invest in index or life cycle funds. I would think that the Roth IRA would be superior in the long run, based soley off the fact that the interest you earn is not taxed upon taking it out. So basically you put in $5,000 (which is taxed) but then get out $6,000 (which is not) basically skipping out of $1000 worth of taxes. Is this logic correct, or am I missing something? If your investments earns $1,000 then yes your logic is correct. You would not have to pay taxes on that $1,000 in earnings. But do keep in mind that returns are not guaranteed, as with all investments there is some risk of loss.